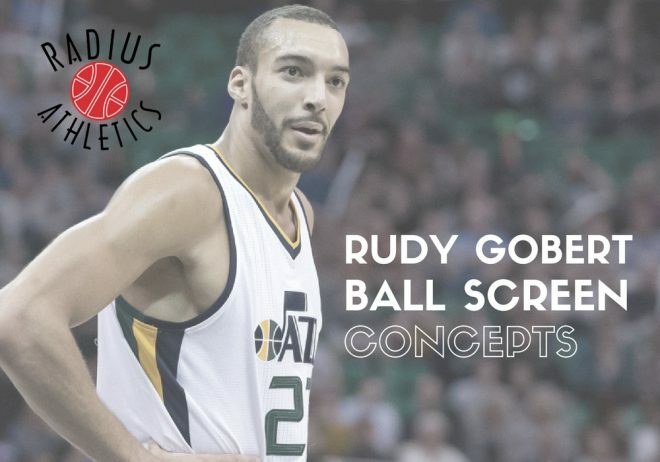 Video gallery of Utah Jazz Center Rudy Gobert demonstrating several ball screen concepts. The following montage features Utah Jazz Center Rudy Gobert. The Frenchman is most noted for his rim protection, but he is also an adept screener. Gobert has a grasp of the nuance of screening angles, roll depth, rescreening and all that goes into ball screen offense. It all starts with running the floor and Gobert is a fluid athlete who looks to use the ball screen to create an advantage early in the possession. The video below features both trail ball screens and wing ball screens with an empty corner from the Utah Jazz transition offense. Gobert and the Jazz create advantages with wing ball screens as well. Notice the common endpoint the Jazz construct around the wing ball screens below. ICE is a common NBA ball screen defensive tactic. The tactic calls for some slight adjustments in screening angles and the ability to slip into voids in the defensive interior. Below Gobert demonstrates adjustments in ball screen offense to combat ICE. Two of the most popular alignments in basketball the world over are the Spread Ball Screen alignment and Horns. In Spread Ball Screen Gobert is able to “break the defense” with hard rolls. Below, Gobert is featured as a high screener in Spread Ball Screen offense as well as Horns Basic. Gobert also grasps the skill of rescreening. In the video below Gobert provides examples of Turns, Twists and Takes and their combination from The Four T’s Of International Offense. Subscribe on YouTube to stay up to date on our latest video projects. Full Playlist of the Rudy Gobert videos here!